Late Tuesday night, the Yankees made a major move to bolster their bullpen as they acquired lef-hander Zach Britton from the Baltimore Orioles in exchange for RHP Dillon Tate, RHP Cody Carroll and LHP Josh Rogers. Britton is one of the top closers in baseball, as he has racked up 139 career saves since he started his career with Baltimore in 2011. The Yankees now have another excellent lefty option out of the bullpen in addition to closer Aroldis Chapman. Yankees Manager Aaron Boone now has a bullpen that is nearly perfect, with Chapman closing, Britton and Dellin Betances as primary set-up men, then a trio of hard-throwing right-handers in David Robertson, Chad Green, and Jonathan Holder. When thinking about the playoffs and games that can go deep into extra innings, Chapman, Britton, Betances, and Robertson all have experience closing games. This is the first in-season player-for-player trade between the Yankees and Orioles since the Yankees acquired RHP John Habyan in exchange for OF Stan Jefferson in July 1989. 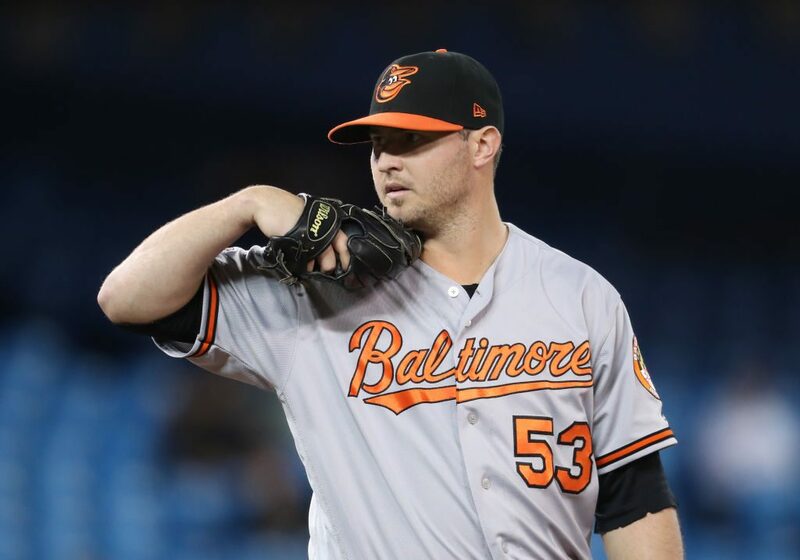 Britton, 30, went 1-0 with four saves and a 3.45 ERA (15.2IP, 6ER) in 16 relief appearances with the Orioles this season. He made his debut on June 12 after missing the first two months of the season on the disabled list recovering from right Achilles surgery. Over eight Major League seasons with Baltimore, he is 30-22 with 139 saves, a 3.22 ERA (516.2IP, 185ER) and 425K. He converted 60 consecutive save opportunities from October 1, 2015 – August 21, 2017, the second-longest streak in Major League history behind Éric Gagné’s streak of 84 straight converted saves from 2002-04. The two-time American League All-Star (2015 and 2016) recorded at least 36 saves each season from 2014-16. In 2016, he went a perfect 47-for-47 in save opportunities, the third-highest save total without a blown save in Major League history behind only Gagné (55-for-55 in 2003) and José Valverde (49-for-49 in 2011). That season, he led all Major League relievers with a 0.54 ERA (67.0IP, 4ER), the lowest season ERA in Major League history (min. 50.0IP) and tied for second in saves (led the AL) en route to being named the Mariano Rivera American League Reliever of the Year. A native of Panorama City, Calif., he was originally selected by the Orioles in the third round of the 2006 First-Year Player Draft. Tate, 24, went 5-2 with a 3.38 ERA (82.2IP, 31ER) and 75K in 15 starts with Double-A Trenton this season and was tabbed as the Yankees’ No. 6 prospect in Baseball America’s midseason rankings. Tate was a 2018 mid-season Eastern League All-Star and is undefeated in his last nine starts, going 4-0 with a 2.70 ERA (53.1IP, 16ER) over the stretch. Over 58 career games (50 starts), he has compiled a 16-7 record with a 3.53 ERA (257.1IP, 101ER). Originally selected by the Rangers in the first round (fourth overall) of the 2015 First-Year Player Draft out of the University of California-Santa Barbara, Tate was acquired by the Yankees from the Texas Rangers with RHP Nick Green and RHP Erik Swanson in exchange for OF Carlos Beltrán on August 1, 2016. Carroll, 25, went 3-0 with nine saves in 12 chances and a 2.38 ERA (41.2IP, 11ER) in 32 games this season with Triple-A Scranton/Wilkes-Barre. A 2018 International League All-Star, Carroll is limiting opponents to a .184 BA (27-for-147) this season, third-lowest among all relievers in the IL. In 111 games (six starts) across four minor league seasons, he is 11-10 with 22 saves (in 32 chances) with a 2.67 ERA (226.0IP, 67ER). Born in Mt. Juliet, Tenn., Carroll attended the University of Southern Mississippi and was selected by the Yankees in the 22nd round of the 2015 First-Year Player Draft. Rogers, 24, was 6-8 with a 3.95 ERA (109.1IP, 48ER) in 19 starts with Triple-A Scranton/Wilkes-Barre in 2018. Over four minor league seasons with the Yankees (2015-18), was 28-19 with a 3.16 ERA (350.2IP, 123ER) in 63 games (58 starts). The New Albany, Ind., native was originally selected by the Yankees in the 11th round of the 2015 First-Year Player Draft.